Our venerable father Silouan was born into a poor peasant family in Tambov, Russia. His youthful zeal for God and the feats of the ascetics soon gave way to worldly living, until he almost killed a man with his great physical strength. 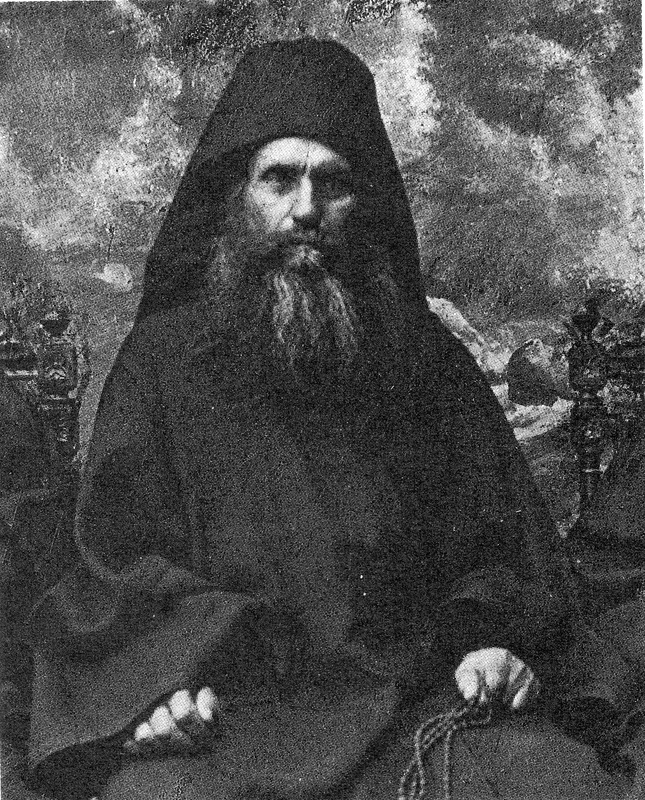 After completing his military service in 1892, he set out for the Holy Mountain and was accepted as a novice in the Sacred Monastery of the Great Martyr Panteleimon, which at that time housed 2,000 monks. Unused to struggling against his thoughts, he was tempted gravely until he learned to drive them away with the Jesus Prayer. After a very short time he received the gift of the “Prayer” by its entering his heart and flowing forth continuously. The grace was followed by many temptations, so great that he despaired until he beheld the icon of Christ and uttered, “Lord Jesus Christ have mercy on me the sinner.” He experienced an ecstatic vision of the gentle Christ, Whom he recognized by the grace of the Holy Spirit. After the vision left he cried out, “My soul yearns after Thee, O Lord, and I seek after Thee with tears!” Having been allowed to withdraw to the “Old Rossikon” dependency to pray unceasingly, he was recalled to the monastery, where he took up his chores without moderating his asceticism and prayed for the whole world with tears. Battling pride for fifteen years he besought the Lord for help, Who answered him, “Keep thy mind in hell, and despair not!” From then on he strove for humility and dispassion and the grace of God dwelt in him constantly. Christ filled his heart with incomprehensible love for his fellow man. This humble Athonite spent the rest of his life praying for the entire world, begging the Lord that his fellow man might come to the knowledge of God, by the Grace of the Holy Spirit. Having run the race, he reposed in peace on 24 (11) September 1938. He left the world a vast anthology of his teachings. Contemporary icon from the Sacred Convent of the Annunciation, Ormylia-Chalkidiki; dependency of the Sacred Monastery of Simonos Petra, Holy Mountan of Athos, Greece. Holy Russia’s wonderful offspring * and the mountain Athos’ * auspicious sacrifice, * eloquent and god-bearing * mouth of the Holy Spirit, * O Silouan the great, * with hymns we honor you. 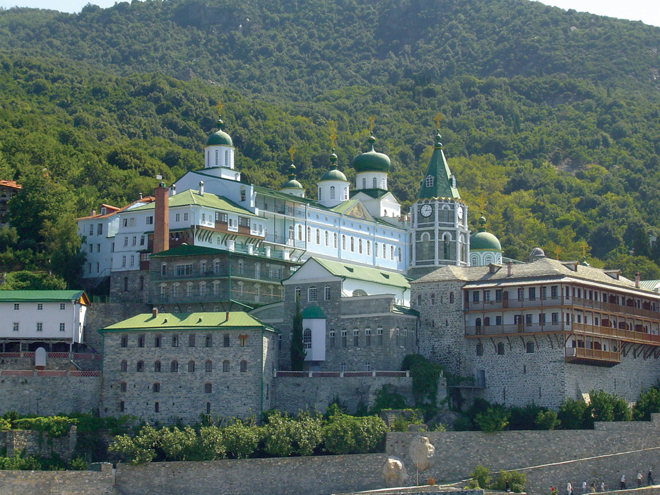 The Holy Monastery of St Panteleimon, Holy Mountain of Athos, Greece.